Sea to Summit Comfort Light Mat. 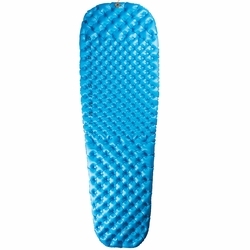 The Comfort Light sleeping mats feature hybrid layer Air Sprung Cell™ technology - a double layer of high resolution cells in the torso for maximum comfort and insulation, and single layer of medium resolution cells in the head and legs for reduced weight. All Sea to Summit sleeping mats come with a quality stuff sack, a repair kit containing six self adhesive patches for repairing punctures in the field, and a spare silicone one-way valve flap. Sea to Summit's TPU lamination process - one used in the medical and aeronautical industries but unique to the outdoor industry - is vastly superior to the roll-to-roll lamination process that is commonly used in outdoor products at present. The TPU bonds better and more consistently, virtually eliminating delamination issues.